Division of Cardiology, St. Michael’s Hospital, University of Toronto, Toronto, Canada. Dabigatran has several clinical advantages over warfarin. These include fixed dosing without the need for routine laboratory monitoring, and significantly less drug interactions without the narrow therapeutic window of warfarin. In addition, warfarin has known food interactions that could affect the efficacy of the drug.6 However, the lack of an antidote to dabigatran in the event of major bleeding poses a serious limitation. Several mechanisms to explain this increased risk include the known benefit of warfarin in reducing MI compared to other anticoagulants,8 and a possible platelet activating effect of dabigatran in patients not on aspirin.9 There is a paucity of reports describing post-marketing adverse events and cases of dabigatran failure. Here, we report a case of an acute MI complicated by cardiac arrest in a patient with chronic AF who was switched from warfarin to dabigatran. 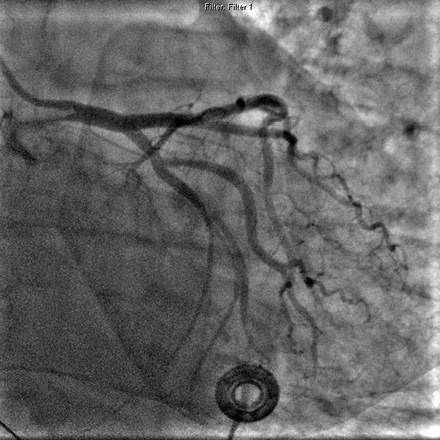 Figure 2: Coronary angiogram (right anterior oblique view) showing only minor irregularities in the remaining coronary arteries. 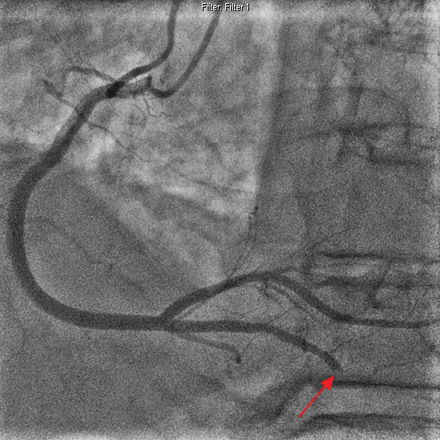 Figure 1: Coronary angiogram (left anterior oblique view) showing (red arrow) an abruptly occluded distal posterior descending artery (PDA) with the angiographic appearance of an embolus. A 67-year-old male was transferred to our institution for an urgent coronary angiogram after he woke from sleep with severe retrosternal chest pain and diaphoresis. In the ambulance, while en-route to the hospital, he was successfully resuscitated after an episode of ventricular fibrillation (VF). The patient had a medical history of permanent non-valvular AF for which he was appropriately rate controlled and anticoagulated with warfarin (since 1999), and had no previous thromboembolic events. Three weeks prior to the current presentation, he was switched from warfarin to dabigatran for convenience. Dabigatran was started one day after discontinuation of warfarin. His cardiac risk factors included treated hyperlipidemia, hypertension and a family history of premature coronary artery disease (CAD). The patient had undergone previous investigations for atypical chest pain and exertional dyspnea. A coronary angiogram performed one year prior revealed only minor luminal irregularities. In addition, an exercise treadmill test performed a few months prior to the present event was clinically and electrically negative. His medications at the time included, in addition to dabigatran 150mg twice daily, bisoprolol, rampiril, atorvastatin, furosemide, and vitamin supplements. He was not on aspirin. Physical examination revealed a man of stated age in no apparent distress. He was in AF with a controlled ventricular rate of 58 beats per minute. Cardiovascular examination was unremarkable. His initial blood tests, including renal function, were normal. Initial troponin I (Tn-I) and total creatine kinase (CK) levels, which was obtained 80 minutes after onset of symptoms, were undetectable but peaked the following day at 37.45μg/L and 598U/L, respectively. [Figure 1]. The other coronary arteries had minor luminal irregularities [Figure 2]. Left ventriculography demonstrated distal inferior wall akinesis with overall preserved left ventricular (LV) systolic function. Medical therapy was pursued. A Definity® contrast-enhanced transthoracic echocardiogram was obtained the next day and showed no evidence of LV thrombus. The LV ejection fraction was mildly reduced at 46% with an akinetic inferoapical segment. There was no evidence of an intracardiac shunt. The rest of hospital course was unremarkable and dabigatran was discontinued. He was switched to warfarin. Intravenous heparin was concurrently used until his international normalized ratio (INR) was in the therapeutic range. His other medications continued without change. Given that his VF arrest occurred in the setting of an acute MI, he did not require an implantable defibrillator. Several theories could explain why our patient suffered an MI shortly after being switched from warfarin to dabigatran. DTIs target the final step in the coagulation cascade, thereby inhibiting the conversion of fibrinogen to fibrin and subsequent thrombus formation. Since thrombin also activates platelets, DTIs are suggested to have an antiplatelet effect.15 However, dabigatran has been reported to increase urinary thromboxane excretion in patients not receiving aspirin, suggesting a paradoxical platelet activating effect.9 In contrast, warfarin inhibits the synthesis of multiple coagulation factors, possibly translating into greater efficacy as a treatment for preventing MI. Although not directly applicable to our case, drug-drug interaction should always be considered. There are reports of decreased bioavailability of dabigatran by 50–60% when certain medications such as pantoprazole were administered, signaling decreased absorption with lower gastric pH.18 This may also play a role in dabigatran failure. However, our patient also had several risk factors for ischemic heart disease and we cannot rule out definitively other sources of embolism. It is possible that the increased risk of MI in patients on dabigatran is an associative effect rather than a causative one. Dabigatran is now commonly used for thromboprophylaxis in patients with AF for its advantages over warfarin. The risk of bleeding in the elderly and in patients with impaired renal function has been described previously. To our knowledge, our case is the first report of an acute myocardial infarction in a patient with chronic AF in the context of switching from warfarin to dabigatran. This finding is consistent with the signal of increased MI rates observed in the RE-LY study as explained above. The excess of MIs with dabigatran may be an associative rather than causative effect. A dabigatran induced platelet-activating effect may be mitigated by concomitant aspirin use. Further studies to elucidate the mechanism of increased MI risk with dabigatran and identify the subset of patients who should be preferentially treated with warfarin are needed. Stangier J, Clemens A. Pharmacology, pharmacokinetics, and pharmacodynamics of dabigatran etexilate, an oral direct thrombin inhibitor. Clin Appl Thromb Hemost 2009 Sep-Oct;15(Suppl 1):9S-16S. EMEA. Pradaxa EPAR. Product information; 2010 March 18. Available at www.ema.europa.edu/docs/en_GB/document_library/EPAR_Product_Information/human/000829/WC500041059.pdf. Accessed 18 November 2011. Health Canada. Pradaxa product monograph; 2010 November 3. Webprod. Available at hs_sc.gc.ca/dpd-bdpp/info.do?lang=eng&code=. Accessed 18 Nov 2011. FDA. Pradaxa Label. Package Insert; 2010 Oct 19. Available at http://www.accessdata.fda.gov/drugsatfda_docs/label/2010/022512s0001bl.pdf. Accessed 18 November 2011. FDA; Cardiovascular and Renal Drugs Advisory Committee. Food and Drug Administration; 2010 September 20. www.fda.gov/downloads/AdvisoryCommittees/CommitteesMeetingMaterails/Drugs/ardiovascularandRenalDrugsAdvisoryCommittee/UCM226011.pdf. Accessed 18 November 2011. Bushra R, Aslam N, Khan AY. Food-drug interactions. Oman Med J 2011 Mar;26(2):77-83. Connolly SJ, Ezekowitz MD, Yusuf S, Eikelboom J, Oldgren J, Parekh A, et al; RE-LY Steering Committee and Investigators. Dabigatran versus warfarin in patients with atrial fibrillation. N Engl J Med 2009 Sep;361(12):1139-1151. Lip GY, Lane DA. Does warfarin for stroke thromboprophylaxis protect against MI in atrial fibrillation patients? Am J Med 2010 Sep;123(9):785-789. Ezekowitz MD, Reilly PA, Nehmiz G, Simmers TA, Nagarakanti R, Parcham-Azad K, et al. Dabigatran with or without concomitant aspirin compared with warfarin alone in patients with nonvalvular atrial fibrillation (PETRO Study). Am J Cardiol 2007 Nov;100(9):1419-1426. Legrand M, Mateo J, Aribaud A, Ginisty S, Eftekhari P, Huy PT, et al. The use of dabigatran in elderly patients. Arch Intern Med 2011 Jul;171(14):1285-1286. DeRemer CE, Gujral JS, Thornton JW, Sorrentino RA. Dabigatran falsely elevates point of care international normalized ratio results. Am J Med 2011 Sep;124(9):e5-e6. Douxfils J, Buckinx F, Mullier F, Minet V, Rabenda V, Reginster JY, et al. Dabigatran etexilate and risk of myocardial infarction, other cardiovascular events, major bleeding, and all-cause mortality: a systematic review and meta-analysis of randomized controlled trials. J Am Heart Assoc 2014 Jun;3(3):e000515. Hurlen M, Abdelnoor M, Smith P, Erikssen J, Arnesen H. Warfarin, aspirin, or both after myocardial infarction. N Engl J Med 2002 Sep;347(13):969-974. Diener HC; Executive Steering Committee of the SPORTIFF III and V Investigators. Stroke prevention using the oral direct thrombin inhibitor ximelagatran in patients with non-valvular atrial fibrillation. Pooled analysis from the SPORTIF III and V studies. Cerebrovasc Dis 2006;21(4):279-293. Brass LF. Thrombin and platelet activation. Chest 2003 Sep;124(3)(Suppl):18S-25S. Lippi G, Franchini M, Targher G. Arterial thrombus formation in cardiovascular disease. Nat Rev Cardiol 2011 Sep;8(9):502-512. Mega JL, Braunwald E, Mohanavelu S, Burton P, Poulter R, Misselwitz F, et al; ATLAS ACS-TIMI 46 study group. Rivaroxaban versus placebo in patients with acute coronary syndromes (ATLAS ACS-TIMI 46): a randomised, double-blind, phase II trial. Lancet 2009 Jul;374(9683):29-38. Committee for Medicinal Product for Human assessment report, Pradaxa. European Medicines Agency 2011;1-79. Viswanatha GL, Mohamed R, Rajesh S, Sandeep RS, Mohammed A, Anturlikar SD, et al. Anti-platelet and Anti-thrombotic Effects of a Poly-ingredient formulation: In vitro and in vivo experimental evidences. Oman Med J 2012;27(6).